We’ve been using Logic of English products in our homeschool for about three years now! I’ve written mostly about my experiences using Logic of English Essentials, a program that’s generally best for Ages 7 and up. Today I’m excited to share about my experiences using Logic of English Foundations with Mr. K, who is currently 6. I’m actually using the Foundations material for the second time. I purchased a beta-test version of the Foundations curriculum when Mr. E was in Kindergarten. I didn’t get in on the first round of beta testers in the fall of Mr. E’s Kindergarten year, and purchased it about half-way through that year. The Foundations lessons weren’t in their final form yet, everything was in PDF (so workbook pages had to be printed out), and I had already been teaching him reading using standard phonics and some Logic of English methods for almost an entire year before we even began Foundations — so I didn’t feel my experience was “typical” enough to really write about it. Mr. K is my first child that I have taught to read entirely using Logic of English materials (not counting adding in additional easy-reader/phonics books)! I began Logic of English Foundations A very slowly when Mr. K was about 4.5, and we continued through his whole PreK year. 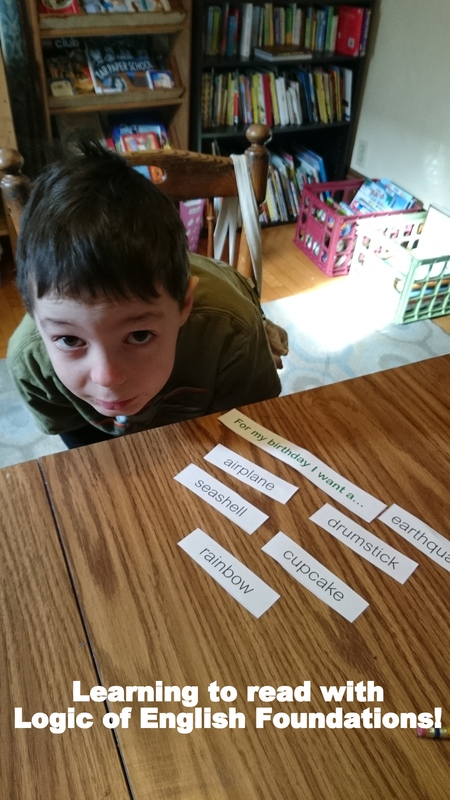 Since I felt pretty comfortable with teaching the initial 26 phonograms, we used the program pretty loosely, and mostly when he felt like working on it. By the end of the last school year, he was reading most any CVC word, and knew all the sounds of those first 26 phonograms. I waited until this fall to teach him lower case letter formation — he really just wasn’t interested last year as a pre-K’er. He had taught himself how to make upper case letters, and was content with that. 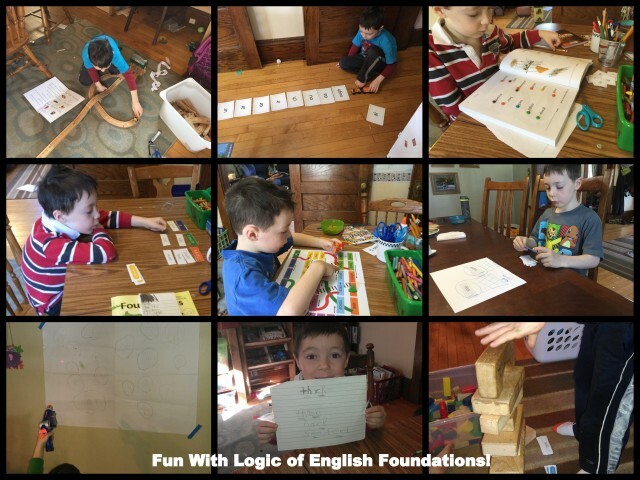 So, after an initial couple weeks spent on letter formation, we started Logic of English Foundations B near the beginning of this past fall when Mr. K was 5.5 and a Kindergartener. Mr. K absolutely loves “doing dragon” as he calls Logic of English Foundations (the workbook covers have cute dragon illustrations). He loves that the lessons have a lot of variety, including games and movement activities. This year we’ve shot at phonograms with a nerf gun, drove toy trains around a track to “follow the directions,” crawled through the tunnel of a “silent e machine,” as well as plenty of hopping, skipping, slapping and tossing baskets as we practice words and phonograms. Mr. K also loves the satisfaction of writing words and reading interesting books that are included at the back of the workbook. There are a lot of things I love about Foundations — the teacher manual is well laid-out and easy to understand, it’s easy to keep the attention of even a distractable kid, and the prep-work for me is minimal. Lessons typically include a short phonogram and/or spelling rule lesson, sometimes a phonemic awareness activity, phonogram practice (usually a game or active activity), a couple of interesting workbook pages (they might be matching, reading, rhyming, or writing) and five spelling words to write down. After each five regular lessons, there’s a review lesson. For us, an average pace of about three lessons per week has been just about perfect. We finished level B in January and moved right on to level C, which we should finish up right as we end the school year at the end of May. Early on we may have done closer to four lessons per week, and it has been a bit more of a challenge to complete three lessons per week in the second half of level C as the lessons get a bit longer. It’s hard to think of very much I don’t like about Foundations! Perhaps the one thing I’ve noticed is those pacing differences as we progress in C. I feel like the last handful of phonograms are being presented a bit more quickly and there is more material to cover. I know Mr. K needs more time to learn all these new phonograms — and with so many new phonograms he as started to confuse some “old” ones he had previously mastered! So, I’m not really expecting mastery of all the more obscure phonograms. While I have followed the teacher manual for Foundations a lot more closely than I follow the teacher manuals for a lot of programs, if there is one thing we’ve slacked on a bit, it is probably phonogram games — certain games take longer than others (card games in particular), or introduce extra distractions as our three-year-old thinks he should play too (it’s tough to tell the toddler that he can’t have a turn to shoot the phonograms, so we usually just let him have a turn too). We’ll play extra phonogram games all summer and review them next year as well in Level D, which should hopefully make up for this shortcoming. Mr. K is a pretty good reader for a six-year-old Kindergartener. While we haven’t done a lot of reading outside of Foundations lessons lately, I am excited for a break from new lessons in the summer just to read! With having had at least exposure to all the basic phonograms by the end of the school year, he’ll be ready to dive into plenty of real books. Overall, I highly recommend Logic of English Foundations if you have a 4-6 year old who is ready to learn letters and letter sounds. With the variety of activities, it should be adaptable to the needs of children with many personalities and learning styles. If you are hoping for a quick “sit for ten minutes a day and get it done” sort of program with no other activities or extras, you might not enjoy Foundations as much. But if you want to tackle teaching reading and spelling in a fun, multisensory approach, then Foundations is definitely a curriculum you should consider. 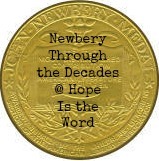 I’ve already read seven of the ten Newbery Award winners from the 1950s, so I had only a few options to pick from if I wanted to read at least one award winner for the Newbery Through the Decades challenge for this month. 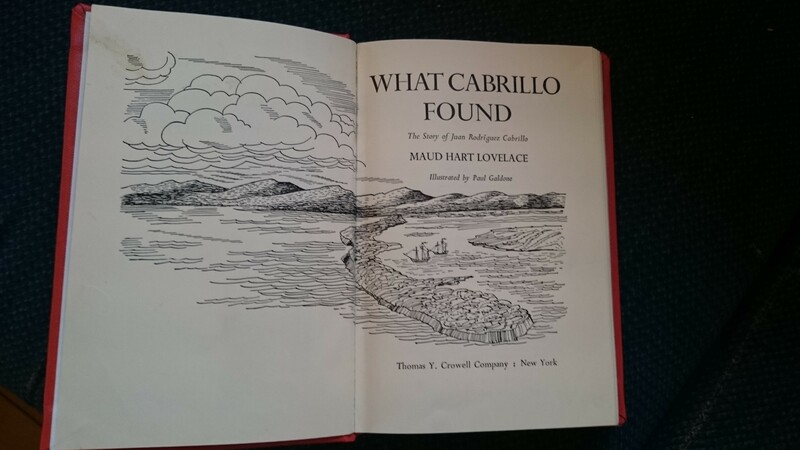 After perusing the descriptions of the three 1950s award winners I had not read, Miss M and I chose, Secret of the Andes by Ann Nolan Clark, the 1953 Newbery winner. Secret of Andes is a coming of age story. Cusi, an Indian boy in Peru of Inca decent, is a shepherd living high in the mountains in the care of Chuto, an older shepherd. The story takes place in modern times, at least modern enough for a brief mention of a truck. Other than that one clue as to the time-setting of the story, the rest of the story easily could have taken place long ago, as Cusi is living just as the Andes shepherds have for centuries. As the story unfolds, we learn more and more about his life (as he learns more about himself). This short (128 page) novel is a bit slow moving. It’s full of beautiful descriptions of mountains, valleys and llamas. But it wasn’t exactly a page-turner that kept us coming back to read it each night.